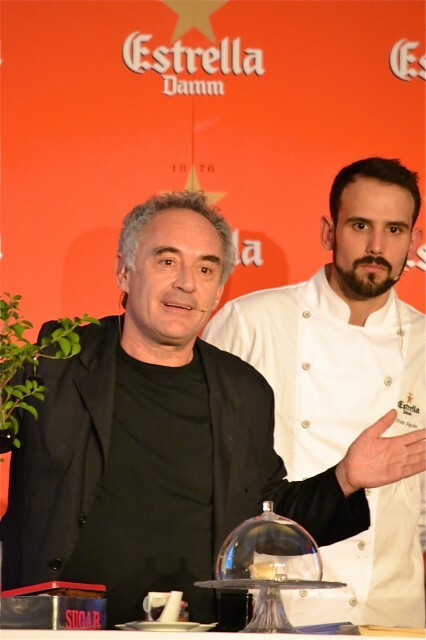 The former head chef of El Bulli, Ferran Adrià, has spoken of his belief that we are living in a golden age of cooking, describing the chefs practising today as the “best in history”. Speaking at the Estrella Damm Gastronomy Congress at the Hurlingham Club in west London yesterday, Adrià spoke of the narrowing of the quality gap between traditional three Michelin-starred establishments and casual dining ventures. “The bar of international cooking has been raised so high over the last few years that the gap between a 3 Michelin starred restaurant and a casual dining outlet is much smaller than it used to be, which I think is a good thing. “The median quality is so high now, which is due to the fact that we are living in an era of best generation of chefs in history to be working in the industry. “You can now get incredible quality food all over the world and a lot of it is coming out of more informal establishments, which is a brilliant,” he said. But with the narrowing of the quality gap comes a need from the world’s top restaurants to differentiate themselves in order to merit their high price tags. “Top places now how to set themselves apart via their wine offerings, service and the restaurant environment as there is less of a dramatic difference in terms of the quality of the food coming out of their kitchens,” he said. Adrià also spoke of the progress made in terms of the quality of the cocktail offering at restaurants, with bartenders increasingly looking to the kitchen for inspiration. “El Bulli was one of the first restaurants to incorporate the technology we used to create our dishes into our cocktails. We integrated both worlds and now a lot of restaurants around the world are doing the same thing with their drinks and are helping cocktails to form an important part of the dining experience,” he said. Having closed El Bulli in 2011 to turn it into a culinary think tank, Adrià now runs tapas bar Tickets in Barcelona with his brother Albert, which he describes as a “prêt-à-porter” El Bulli. In addition, the brothers Adrià run cocktail bar 41º Experience and Vermouth bar 1900 in Barcelona, with casual dining restaurant “Enigma” slated to open next year.